Kim Sung Kyu has been one of my favourite artists in the industry for a long time. That includes his works as part of Infinite and his solo career. 2018 marked the start of a new era for Sung Kyu with the release of his first full-length album, 10 Stories. As this review is quite lengthy, I am going to get straight into it. Kim Sung Kyu has finally made his solo return to the stage with his first studio length album, 10 Stories. The title track featured on this album is True Love. His comeback was a little unexpected, with Infinite just recently wrapping up their promotions for Tell Me at the end of January and his teaser pictures just coming out of nowhere. This is his first comeback since his last mini-album and double title track promotions of The Answer and Kontrol. To me, True Love is the midpoint that I would imagine if Kim Sung Kyu and Ed Sheeran joined forces to make a song. While the song’s sound and instrumental seems to lean more heavily towards Kim Sung Kyu’s side, there were a few moments throughout the song that felt like the song could have gone down that Ed Sheeran route. I like how calming the song feels during the verses. The build-up just before the chorus was nice but my favourite bit has to be the launch into the chorus. It is where the song comes together and it is the strongest point of the song which reminds me fondly of Kim Sung Kyu’s previous works. There is a slight catchy hook to the chorus, which I can see myself singing to in a few days time. His vocals are great but they don’t really shine as much in this song. Overall, the expectation (for me) is that Kim Sung Kyu would have a really good song as his title track and True Love seems to live up to that expectation. The music video was shot in Hong Kong, which seems to be the number 1 destination to go to, for shooting a music video. A number of artists in the past year alone have shot their music video in Hong Kong. And I can see why. Despite it being featured so much last year, the sites of Hong Kong always look breathtaking and fresh. In the video, it seems like Sung Kyu is looking for his lover, whom he has been trying to track down from a letter he got from her. The ending was a little confusing, how he reads the letter. It makes me question whether he was looking for his ‘True Love‘ or whether he was looking for closure. The walking around on the streets is aesthetically pleasing and sets it up to be a good video (especially with all the great sites around him). Infinite is back after a year with a brand new comeback and mini album. Bad is their 5th mini album that was released with Back being their last release in July last year. Since Back (hehehe…), Infinite has been very busy with drama filming and promotions. Infinite H made their subunit comeback at the start of the year with Pretty. Sunggyu also made his solo comeback with double title tracks: The Answer and Kontrol. On top of that the boys have been releasing singles in Japan such as Dilemma which I reviewed earlier in the year. So many hyperlinks in the introduction today. The music video is also quite interesting. The guys are tormented by this girl who they are describing as “bad”, hence the title of the song. The make use of mirrors in this video quite interestingly, being a way for the girl to get to them. I find that is an interesting concept. Hence why we see them sitting around, running away and looking around in fear due to the mirrors. And from the very first time I saw the music video, I knew it was the same guy or girl or group of people who filmed Orange Caramel and EXID music videos (and of course countless other music videos for other artists). I was amazed by the teaser for this comeback though. I believe they are the first KPOP group to actually use the 360 degree video format, which I thought was hella cool. I watched it on my phone and could spin around and looking around in the 360 view. Awesome. Just one complaint however, Dongwoo’s rap segment in the music video does not match up with the song. The lips were way off. The dance is always awesome for Infinite. They are always in sync with each other. When I thought saw the dance, I was thinking that there was no way they would be in sync since there was a lot going on. But, the group managed to prove themselves to be one of the best dance groups ever. It is another Double Review. I have a few more lined up, so this is going to be fun. Anyway, too much to write and review. so let’s move along. Kim Sung Gyu is the leader of Infinite and has returned with his second solo mini album, after 60 Seconds, which was released back in 2012. Since then, he has been promoting alongside Infinite. Fans have been requesting a comeback from the singer since his solo debut. The first song I will be talking about it The Answer. Actually, I am going to say this about all the songs on the album. It has been sometime since I have listened to a whole album. This whole mini album was so perfect. Every song was produced and presented to an exceptional standard. The Answer is a ballad, with a bit of pop sounds in it, but it stayed more on the classical ballad side throughout. The song was very beautiful and I could feel the emotion from Sunggyu in the song. Many people know I have a soft side for ballads and this song just ticks all the boxes for an amazing song. Vocals blew me away, the instrumental was so calming and powerful. Though I prefer this song over the rest (as this is beyond perfect), all the other songs are so well done, so go and check out his mini-album guys. As for Kontrol, it had more of an electronic funky style of beat to it. I guess it is more of a ballad, but it has that additional feel to it as a pop and electronic style song. Once again, the vocals are amazing here. I particularly like the chorus. The song builds up to the chorus and I just love it. From start to end, this was also another exceptional song that did it’s job very well. On top of that is was quite unique. It would be hard to pick a personal favourite, but I go for The Answer any day. As for the music videos, both was pretty good. The Answer was more monotone. It was shot in a grey scale filter (not the whole video though) and only really contained shots of Sunggyu singing throughout the video. There were shots of him being distant and lonely, but it matched the song’s feel really well. The video seemed like it was warming up, because we started to get this old brown vintage colour and then full colour was introduced. I honestly thought it was a very beautifully shot video. However, not sure about the floating diamonds. I really did not know what they represent. Maybe memories or something? Kontrol’s music video was another beautifully shot video. From a foreigner’s perspective, I hope that was Sunggyu’s lover. But at the same time, the girl being his sister matched the story line really well. The move into this alleyway, which consisted of nothing, but I guess with a bit of imagination, you can turn nothing into your own space. It seemed like they live there as well. The decoration for this alleyway suited the sounds of the song really well. I enjoy the choppy camera shots in this music video, as they matched really well with the instrumental. From the video, we see that she goes missing and Sunggyu goes to find her, or in fact the place that she “went on”. It turns out it was the seaside and that the girl probably drowned and Sunggyu could not leave her. Now many people have speculated that this song and music video was done in honour of those who passed away on the Sewol Ferry Accident last year. But Sunggyu said it wasn’t and just a song about a lover. But nonetheless, the music video did have many shots that corresponded to the accident and either way, it was a sad video still. But still amazing. There is a dance for Kontrol, but I am going to gloss over the dance. Mainly because Sunggyu doesn’t participate in the dance himself that much. Overall, I think this by far, has to be one of the best comebacks of the year. As I said, not just these songs, but the whole mini album from Sunggyu was perfect and so amazing to listen to. Pick a song that you enjoyed 🙂 For this poll and the past two polls, I will put the results in the Rewind posts for the month. It has been so long since I have written a Japanese song review hasn’t it?Well, that drought hopefully will be over today. I am hoping to increase the amount of JPOP or Japanese songs this year that I will actually review. And least break the drought with Infinite’s newest Japanese song: Dilemma. The song was a collaboration between the famous producer Tomoyasu Hotei and the famous Korean band Infinite. The song has its really cool rock and roll roots, but also includes dance themes and also a really cool modern feel to the song. The song literally hits you as soon as it starts. It is a very powerful song and really oozes out the energy that the boys have. The chorus is really catches my eye, because it seems different from the rest of the song. That is a good thing though, so don’t be mentioned. I am not really a fan of the rapping in the song. They did a good job, just it slows down the song. That really long instrumental part in the song really sounds cool as well and actually picks up from the rapping pretty well. There is just one little complaint. And this complaint kind of goes with many Korean artists. But if the title of the song is an actual lyric in the song than learn how to say the word properly, especially if it is in a different language. Beside that, the song was really good to listen to. The music video was pretty dark. I don’t know why but the music video gave off the same feel as Last Romeo did for me. Just there was less colour and a lot more close up shots of the member. There is also a mysterious band playing in the music video. Most of the time we only see their silhouette. The music video also had that violent side to it. Hahaha. Yes, glass breaking was a little repetitive in the music video. I am sure one member would have been fine. I really don’t know what to say about this video now. Okay I guess. There is a dance in this music video, however we don’t get to see much of the dance in this video. Though from what I have seen, the dance fits Infinite’s style of dancing. Pretty good. 8.7/10 – A really cool release in Japan. Hopefully, they might be able to bring this song to Korea (or at least this style for their future comeback? Finally, another Japanese reviewed finish. If there are any other Japanese artists that you think I should be reviewing, please comment the name of the artist or group and also a song that they have sang. Will do my life wonders, as I have no idea who is who in Japan (though at the moment I am looking at another artist in AVEX). Infinite is finally back a brand new song. It seems like just yesterday that they were performing. Oh wait, didn’t they just finish promoting Last Romeo just like early last month? That might explain it. Hahahaha…. The group is back with a repackaged album of Last Romeo, which had been retitled as “Be Back”, which contains all their other songs from the Last Romeo album and also 2 brand new songs, Diamond and Back. The latter is being reviewed today. Probably one of the most violent videos ever. If some of you guys remember, last time they promoted Woohyun was injured. This time around, Hoya is injured. So many injuries. And so little time to review this. Sorry, I was drowning in homework when I started this review. Whoops. This song is freaking amazing. I have no words to describe. I was speechless, but my jaw did not drop a mile. It is a really nice song that is a wonderful mash-up of different genres, just I don’t think it is that memorable overall. However, the song is quite up there as one of my favourites. As soon as the song starts, we get some kind of ballad of some sort, but little over a minute and the beat drops. Basically the thing that really stands out for me is that Infinite is quite known for their dance songs, with all of that heavy choreography. On top of that, myself and probably the rest of the fans really enjoy their ballads as well, so this song combines both of them. Pretty decent. I liked how the song goes from slow to fast and back to slow, and then back to fast. It sounds really amazing. Another thing to note, is that there are no raps. Members Hoya and Dongwo who are known for rapping all end up singing vocally in this song which goes to tell how strong their voices are. All the other members get decent line distributions here in this song. just I think Sunggyu ends up dominating. I also found the “Back Back Back” part really catchy and the instrumental equally as appealing. Probably a video done right. It has a 19+ rating, but hey there is none of that sexual nonsense here. Just a very young girl is being kidnapped and a fight ensues between the kidnappers and the band, which turns ugly in just about 1 second after the “Back” and Infinite sign took over the video. Just the one thing that is troubling me is that the girl looks like she is still in elementary school. Probably young enough to be the youngest sister of one of the members, not their lover [CORRECTION: The girl actually is the sister. My bad]. Anyway, the boys go into this abandoned warehouse to save the girl. As soon as they walk in they start fighting. Some are throwing punches, some are doing really weird flying kicks. Just Sungyeol is very angry, and pulling the minions hair and Sungjong, are you holding an umbrella? “Hey you got the guns? No. Well what do you have?” An umbrella. Wow. But hey, don’t look down on him because that umbrella is probably the world’s deadliest. However in the end they get overpowered. However, it seems at the end, they start going back into combat when we all first thought they had lost. Amazing what love can do to you. Beside the violent nature of the video, I thought the video was quite nice to watch. The solo shots look awesome and those scenes where the members, one by one, are sitting behind the fence, in the middle of the fight, looked pretty cool to watch. The dance is pretty good. I really think the start was probably the best out there. It matched the slow start and then when the song started to get quicker and there was more of an electro sound to it, the dance picked up as well and started to be more fitting for a dance song. Infinite has recently made their comeback with a new album. After solo promotions and solo activities such as acting, the group has finally hit the stage as romantic men again. However, this is not the first album from the group this year. In March 2014, the group released “The Origin” which is an instrumental album which consisted of all of their hit songs and other popular non-title track songs. The album itself was split into three version, each with their own category. An amazing album, that you all should check out. But this is there first release of the year that contained their voices and it seems they are getting a lot of love with four awards already and we are still counting the endless number of the awards that are yet to come. I guess this song takes rock and roll, brings down the level of power of the song and mushes it into a love song. Okay, if I put it that way its sound like a horrible type of song doesn’t it? But I think it is a cool Infinite style song. It was quite upbeat, powerful like their past songs. I really liked the drums throughout the whole thing. Though to me, the song was not as memorable as their past songs, but it sounded pretty good. Dongwoo and Hoya sound like they are really good professional rappers and to me, they improved greatly. I find the vocals of this song pretty good as well. The rock feel of the song makes it a stand out compared to the rest of the songs that have been released recently. The whole song to me seemed to be written around Romeo’s point of view of Romeo and Juliet. Overall a pretty cool song, however it could have been better. The music video is pretty cool I loved the short intro they had at the start. The music video is back to the dark ages which I really enjoy from the band. The music video tells the story of a couple who seems to be lost in time (I assume that is what the start was) and somehow they conjure themselves up at a library. At the library, Woohyun find clues to find the missing girl. They meet but unable to reach other, so Woohyun goes running after her, to which the girl just walks off, as if she is teasing him. The she disappears and he reaches the middle of the libaray, where he is so angry that he unleashes the 1000 years of fury and blows everything up, to which he is transported back to wherever he first was (or he died). Not sure. The plot seems to fit in partly to the song, but really some things could have been much better. I like their dance scenes, with the fake White House like structure and those pillars. Without the reasoning with the song, I think the music video was much better than expected, but with the song, not so great. The dance is pretty cool. It is such a pity that Woohyun got injured and now he looks really awkward dancing the whole thing with his hands gripping his belt, but that can’t be helped. But overall, I liked the dance. 7.5/10. A pretty cool comeback this time around, it just needed that something more to add to it to make it sound and look better. Infinite recently made one of the biggest comebacks of the month since March, with Destiny. Man In Love was released back in March, giving the guys an extra boost in popularity, earning them major awards in their promotion period. One of which was winning a whole week on all 4 music award programs at the time (MBC Show Champion, Mnet MCountDown, KBS Music Bank and SBS Inkigayo). They also won the first award, in 2005, to be presented at MBC Music Core. Very big achievements. Let’s all hope this song will do well as well. Why I am saying that: Brown Eyed Girls, Kim Hyun Joong, Beast, 2NE1, F(x) will all be making (or have made) their respective comebacks in the past week or in the upcoming week. Destiny is one of the best Infinite songs that I have ever heard of. Though some would agree, this song was much better than Man In Love and is also a return to that Infinite style that we all have been dying to hear from the band. Many say it does not have the Infinite style which we hear of when we hear songs like Paradise, Be Mine, The Chaser etc, however I think it does. Just me? Anyway, this song is really addictive. A song that background instrumental does not get in the way of the vocals in this song. It too has that classical feel that Infinite tend to go for when releasing songs. That little instrumental of the electro vibrating sound is really cool. I find the song has an even spread of the artist. Woohyun and Sunggyu are not dominating the vocals part the song, and it seems like the other members (especially L) has more lines. The song starts upbeat and really high but for the first time (I think) I heard a song slow down at the chorus. You think I would complain, but I really like it in this song. Dongwoo and Hoya’s rap were extra strong from what I hear. The song itself is much more stable than their other songs and am I the only one who is addicted to Woohyun’s “No Way” at the end? Cause damn, that was some good stuff. The music video (version B) is really confusing. Hence, will I return to reviewing the music video when version A comes out? Maybe, since I gather from Version B music video is that the Infinite boys start having weird super powers or some kind of ability because we don’t see them using them, when they a) step outside or b) when they breathe. It seems like the whole thing is a play off of Hulk, like when they get angry and they go crazy about stuff. The music video that was released definitely is lacking in some parts. I personally cannot make a review with just an empty review of the music video. Also, some of their powers are lame. “I can turn my imaginary twin into dust” and “I can disappear into a pile of dust” is not that impressive. Oh, also, “I can drive” is not really a super power, Dongwoo. If it was, declare me a superhero. The music video is filmed in a proper American studio which lives up to the hype about it, because damn, that is some professional stuff that they are doing. The dance has “some attitude in it”. Like woah. The dance is not as impressive as I had expected it to be, but that hands to the side and head bobbing dance looks really unfitting for the song. Overall, not great as a dance because there is nothing to comment about. Not great or that bad that would do terribly in the world. So I guess I have to wait for the next music video. Let’s hope they are not like SMent, who released the music video after the promotions. So far though 7.5/10. The song was not expected at all. I was expecting something along the lines of The Chaser, Paradise or Be Mine. Instead we got some kind of cute aegyo style song from the boys, somewhat similar to their debut song. They brought us back tot he original pop era, like the 2000’s and that is pretty cool, as they always do. It took me a few listens to get used to the song. I don’t like the start that much. If it was a live band, the intro would’ve been amazing. But the intro sounds really modern and computer-like feel to it. The verses were okay, but did not stand out too well. The chorus too seemed that well. The raps are pretty cool, and stands out the most in the song for me. Okay, I will just say this: the song, overall is okay. It is definitely not the best, but okay. The music video is quite interesting? I don’t know if the right word was used. We see a bunch of guys in love with a girl and want to please or surprise the girl. Let’s go in order, the first guy (sorry, i don’t his name) is madly in love with hat cat, not a girl. Woohyun, is kind of in love with someone (that bear at the end?) and plays the piano horribly (Guess the music industry is not for you, mate). Myungsoo, seems to be madly with the idea of love or his cell phone In a casual class all he thinks about is love. Kind of freak hey? That guy who cooks can’t actually cook. Yeah, last time I checked, there are no apples whatsoever in a recipe for fortune cookies. Dongwoo, creates a library out of the hall way, don’t know how that symbolises love, but hey, I just hope no one lives above that library of his. Sunggyu, seems to be the most convincing. Hoya, on the other is the most awkward one. He goes into a store, embarrasses himself by trying out clothing and ends up buying a necklace, which for some reason does not try on. But beside being comical, I liked this video. The dance was okay. Nothing major, expect for that part where Hoya and Dongwoo has towards the end. It looked cool. The dance was not overly complicated and shall not be known as a difficult dance, like what the guys have done before. 7/10. Okay, I guess, but could’ve been loads better. Kim Sung Gyu started his follow-up promotions right after promoting 60 Seconds with I Need You. This takes Sung Gyu’s passion for rock even further with a slow, rock ballad. Though this is not the best song for him to sing to follow up (in my point of view, he just should’ve stop. None of his other songs on the mini album was that great compared to 60 Seconds), he still made the song sound good. This is a song that is much slower than 60 Seconds. It is alright in my point of view, and is something that came out of the rock era back in the day. His vocals are pretty good, however it does not bring his talent out as 60 Seconds did. I think 60 Seconds is more of a rock song, while this is more of a ballad. I liked the drums in this song, and that piano is pretty good as well. However, this is not my cup of tea unfortunately. The music video is pretty epic. The black and white filter placed on the video is pretty good. The slo-motion of the video is pretty good and it fits the whole feel of the song. I am not sure about the musicians though, they look like they are really sick. I love the transition to the colour screen which makes the video much more epic. The transition itself fits the pace of the song as well. For the musicians, they seem like stalkers, because every time he turns the corner, they are right there. The smoke creates a hazy image at the end and actually blends in quite well. So a pretty good music video. The live is just a band performance. Nothing much to complain about here. 7/10. Pretty good overall, but the song is just not for me. A song which goes for more than what the title says. Kim Sung Gyu, aka. 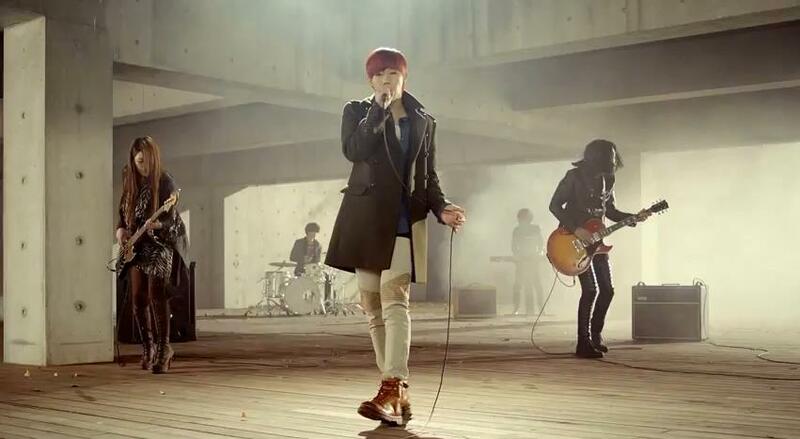 Leader of the boy band Infinite has finally made his well anticipated debut as a rock singer. This is quite remarkable as I was expecting some track like a dance song or similar to the bands past top songs. I was blown away from the unexpected songs this guy threw at us! Anyway, the song is a mash-up between a ballad and rock song, with the song pretty well done. The song is quite interesting. I really like the use of the instruments in this song. Though this is not the best song out there, I still really like this song. I focuses on drawing out our past relationships and make us remember the horrible times we had. I like his voice in this song. Not really keen on the songs he sings with his band, but this genre definitely fits his voice really well. I really like the way he sings the chorus and says the word “story”. Very interesting. The music video is quite confusing. This guy is walking in the sunshine and notices this pretty girl. The world stops for “60 Seconds” so he can admire her, but she does not catch him and continues her job at the cafe. He realizes she is his long lost girlfriend or something. He then proceeds to get her attention by following her into the cafe and not paying for the coffee he ordered. He leaves the ring behind and walks away. The girl however notices the ring, and runs to return it, however soon notices that eh is her long lost boyfriend, who broke up ages ago. All during this time, they have flashbacks of their happy past. Yeah, confusing. I was not sure if he was her boyfriend or not or ex, or just some random stranger, as the music video does not properly give this detail to us straight forwardly. The performance is really good actually. It seems like he has his moments with the microphone, as if it is his long lost girlfriend. 9/10. Really good for a debut.